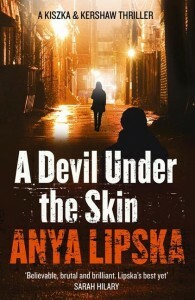 A Devil Under the Skin is the third thriller from Anya Lipska starring police officer Natalie Kershaw and Polish private eye Janusz Kiszka. I’m a big fan of this series – see my list of my favourite books in 2014 which included Where the Devil Can’t Go and Death Can’t Take a Joke, the first two books in the series – and the third book doesn’t disappoint. Once again Kiszka and Kershaw tackle the same case from two different angles, but this time the collaboration grows organically out of the relationship that developed in the first two books. Kiszka still doesn’t trust the police, though, so once again the two protagonists are working on incomplete knowledge of the situation, and working the case with their own priorities and their own goals. As the book begins, life is looking up for both Kiszka and Kershaw. Janusz is looking forward to settling down with his long-time girlfriend Kasia, who’s finally decided to leave her no-good husband, and the pair of them are even sofa-shopping in IKEA. Natalie has got over her stabbing (see Death Can’t Take a Joke) and has joined SCO19, the Met’s armed response unit. But before long, Janusz’s plans are in tatters as Kasia goes missing, and Natalie’s career has taken a nosedive after a fatal shooting leaves her on suspension and facing regular appointments with a therapist. At least Kershaw’s suspension gives her the opportunity to help when Kiszka overcomes his reluctance to deal with the police and gets in touch with her. Soon they’re both embroiled in a series of nasty murders as they try to find what has happened to Kasia before it’s too late. The secondary characters are great, too. Long-time favourites in the series DS “Streaky” Bacon, Kershaw’s old boss, and Oskar, Janusz’s larger-than-life best friend, return and are in fine form. Especially Oskar, whose trip to a spa with Janusz is the comic highlight of the book. A new character is Stefan, an old man in a nursing home, who stayed in Britain after the Second World War rather than return to a Poland under communist control – Stefan’s a great character, and I liked the shout-out to the contribution Poles made to the war effort in WWII. This series is going from strength to strength, and I eagerly await future instalments.